Let's Love Chinchillas is based out of California and over the years we've watched as several local horrific fires threatened the lives of pets and their owners. 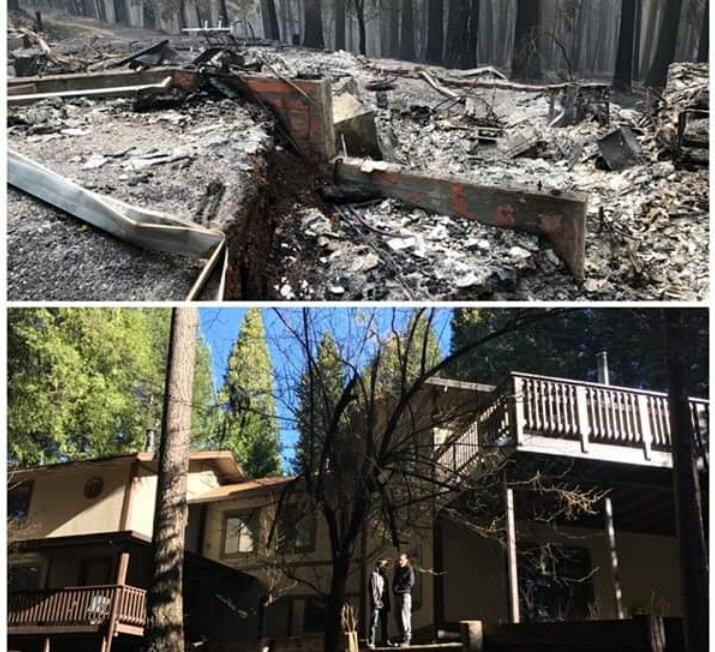 The devastation these fires cause is indescribable. 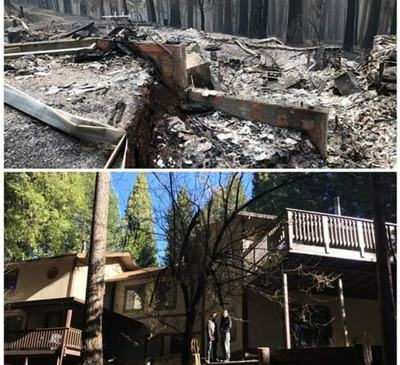 In addition to the fires that run havoc in California, we've seen other disasters unfold in other areas. Events like wild storms and hurricanes causing families to loose power, or their access to clean water and food. Earthquakes that devastate towns leaving owners without anything to care for their pets. During events like this that threaten your well being, or strips you of everything you have, we feel the last thing you need to suffer through is the loss of your pet too. We hope that by offering this page, with resources and information to help you, you will be better prepared if an emergency were to happen. When you are put in a situation where you must evacuate there is so much pressure to be ready to leave within minutes. During that time you need to focus and remember that YOU are the priority. When this situation prevents itself YOU must be safe, because if you become injured or over encumbered you put yourself and everyone around you at risk. The phrase "don't be a hero" really does apply. Only do what you can do safely, and quickly. We do not want to stress emergency personal more than they already are. I personally value humans above animals, and I know not everyone shares that same view. We deal with fires yearly here and though I love my pets dearly, my first instinct is to abandon my home to get the neighbor children out of their homes and to a safe distance before I return for my animals. Your family comes first, please get them out before attending to your pets if it is at all possible. I know it's not easy to make those choices and I hope that by reading the rest of this page, you will never have to choose between your family and pets. Before we share some advice below, please take a moment to read about Shahna Powell. 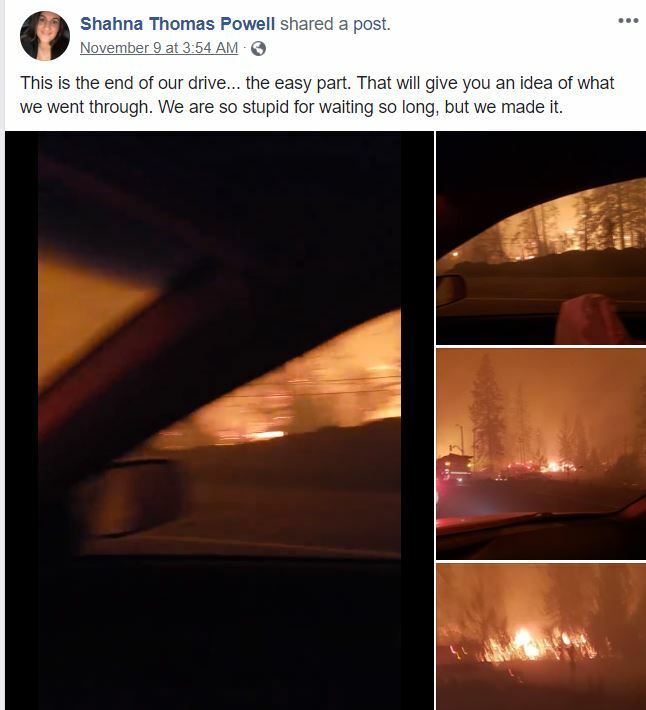 On Nov 9th, around 4am, Shahna and her family had to evacuate their home in Paradise California due to the devastation that #Campfire has caused. 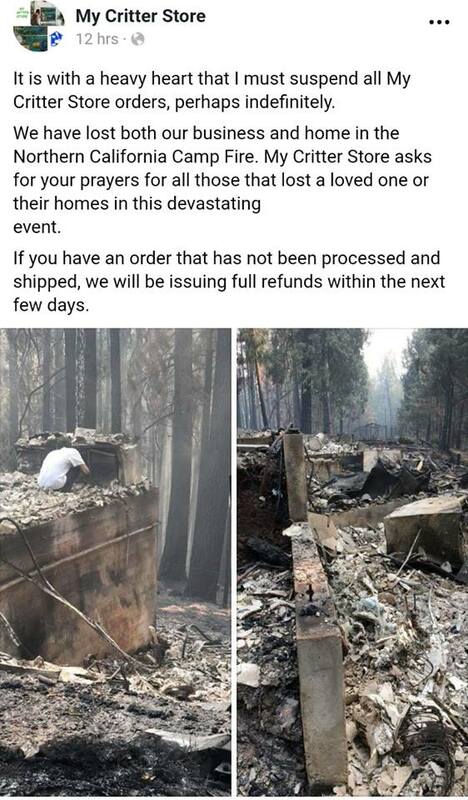 ​Right now, on Nov 12th, at least 31 people have lost their lives to the fire and 200 people are still missing. 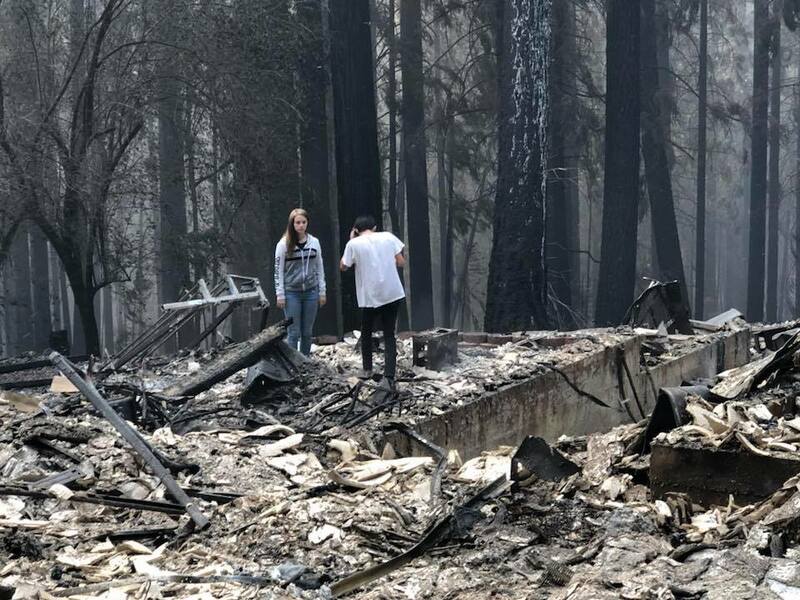 Shahna and her family are of the lucky hundreds of people who fled from the fire and survived. Shahna is a chinchilla breeder and is the owner of My Critter Store. 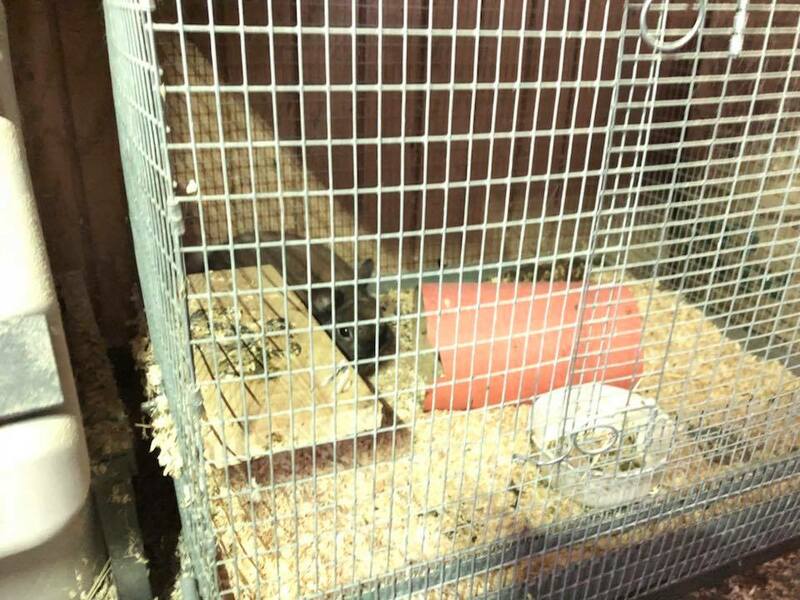 She's always been an ethical breeder, who has cared for her herd and stray chinchillas alike. We've even purchased from her in the past, and we loved our pet chinchilla from her. 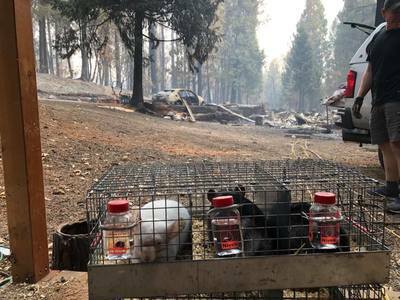 With the fire quickly approaching, Shahna and her family had to evacuate their home with over 100 chinchillas, as well as other pets like dogs, chickens, and turtles. During the panic, 3 chinchillas and a rabbit were unfortunately left behind. Thankfully, they were spared! The fire did not reach her Chinchilla barn! However, their family home was engulfed and destroyed. 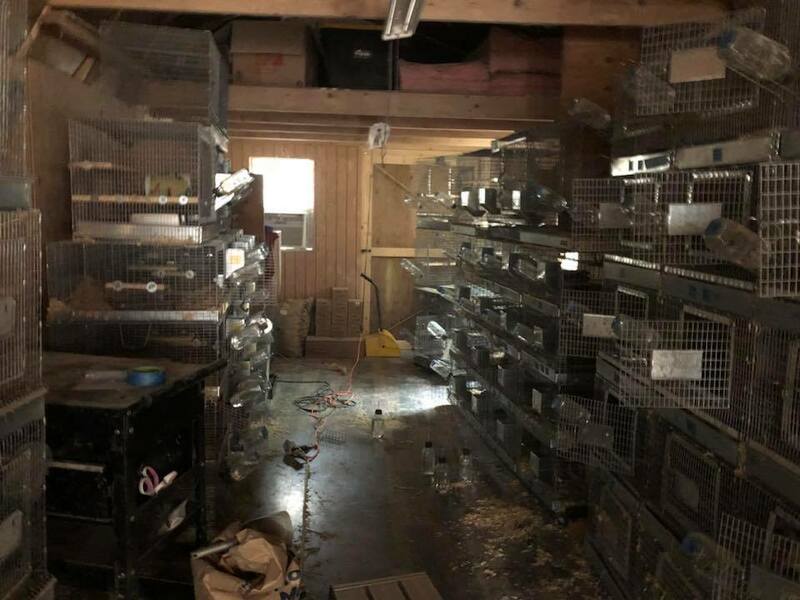 Her herd of chinchillas are safely in Manteca with Chinchilla Chateau ( Sumiko, a friend, and another ethical breeder ) but her family is without a home. 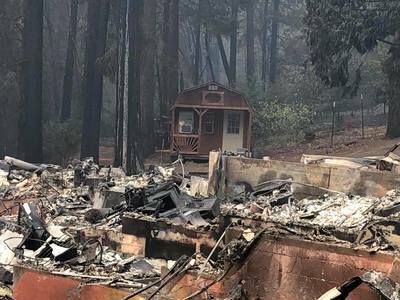 Shahna and her family are frantically looking for a rental for themselves and their pets to call home until they can start rebuilding their lives. Also, due to outcry from supportive community members, The powell family has made a GoFundMe to help raise funds to get back on their feet. If you can spare anything, please consider helping this family and their pets. A safe carrier : A carrier made of all metal is best for long-term use. However, any carrier will work in the moment. You will have to monitor your pet to insure they do not chew free from a plastic carrier. You do not want a large carrier. 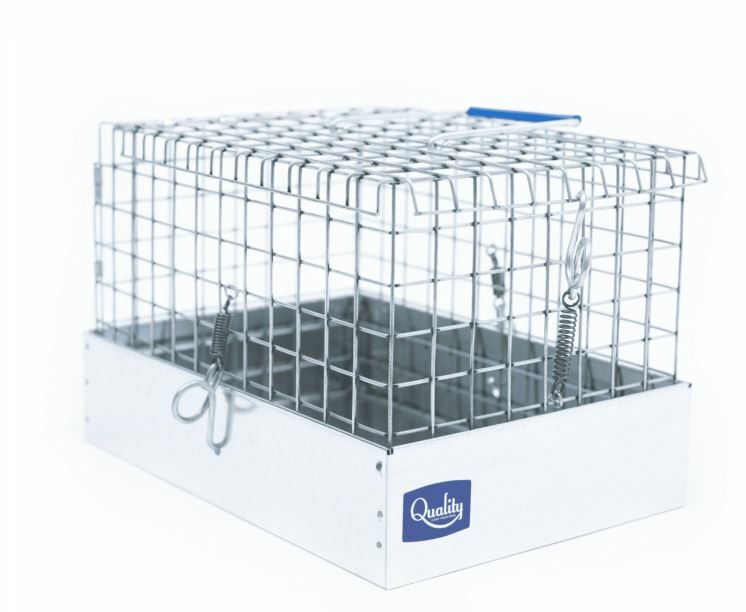 A smaller carrier will prevent your pet from thrashing around or becoming injured if the carrier falls, or is dropped. 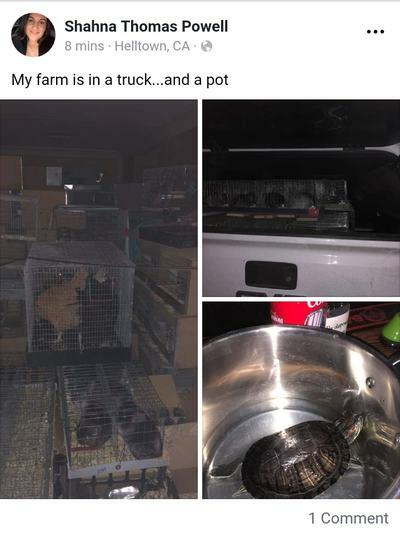 A small supply of food : Your pet's current feed. A new, small, unopened bag OR a ziploc of your current feed, replaced every few months for freshness. A supply of water: 1-2 water bottles set aside for your small pet is recommended, also a bottle if your pet drinks from a bottle. Bedding if possible : A ziploc bag with a few cups of bedding to ration. Husbandry is still important. A small kit containing basic first aid items: triple antibiotic ointment ( burns or small scrapes ) , infant gas drops ( bloat issues ) , saline eye drops ( to clear the eyes of derbies or smoke ) , an E-cone ( to prevent chewing any injuries ). An additional item worth adding to your emergency carrier is a tag with your name and contact information, as well as your vet. This will help your pet get returned to you if, for some reason, you become separated from your pet's carrier. ​Having a carrier and the items your pet NEEDS before hand will save you time that you need to have available during an emergency. 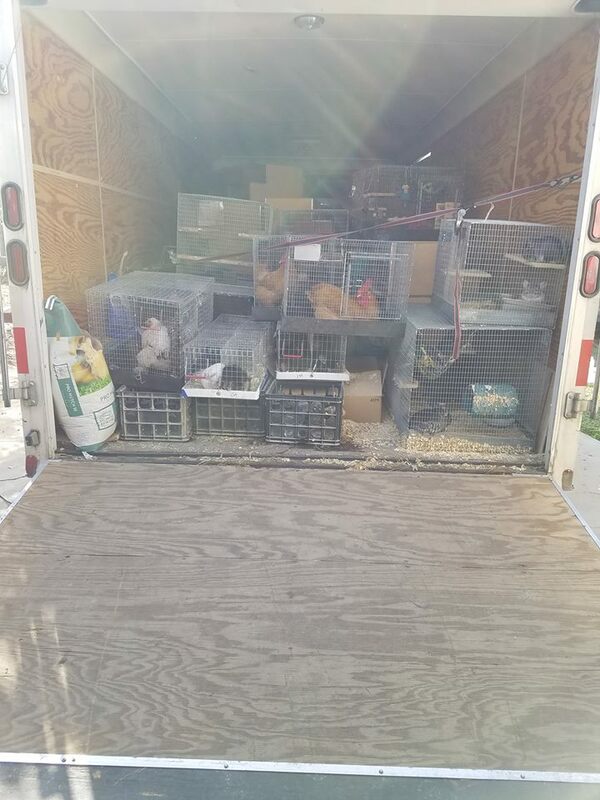 Many owners pack a carrier for their pet and leave it near the cage. We suggest packing the necessary items inside the carrier so it's all on hand. These are just the most BASIC suggested items, if you feel like packing a chew toy, dust, and other small light-weight items, feel free to. 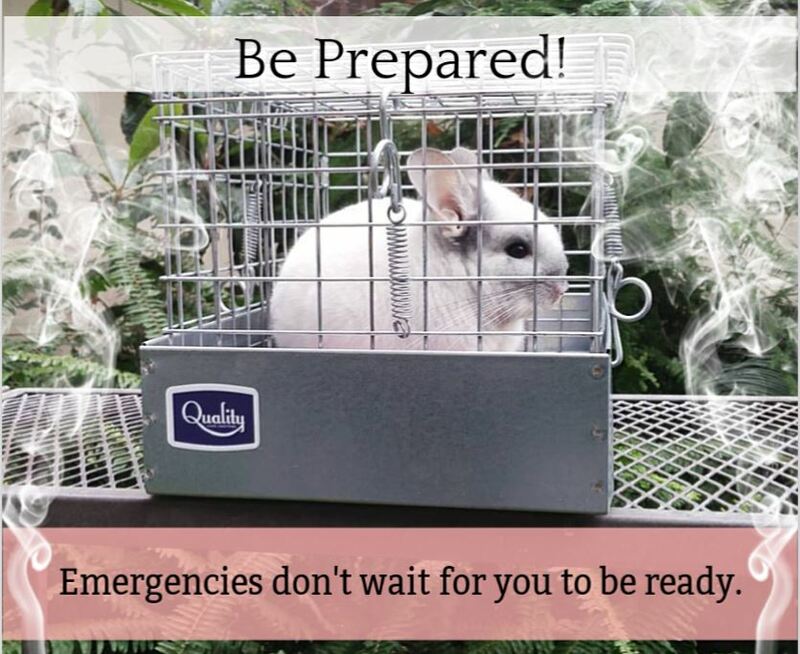 It will come in handy if this carrier becomes a long-term cage solution during the emergency. This list can be applied and amended for most small pets. However YOU will also need supplies too, so please only tend to the animals after you have what you need. Click photo to go to the shopping link. 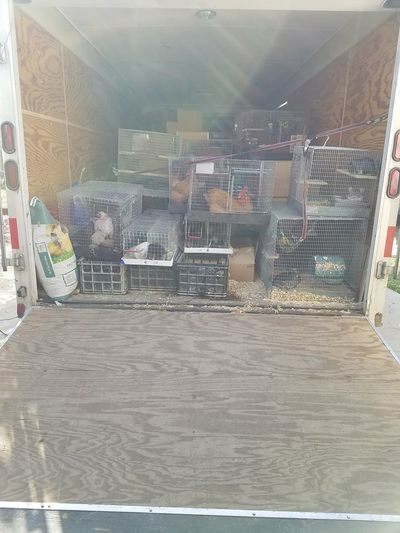 We have also had great luck finding quality metal carriers online through craigslist by searching for "rabbit carriers". 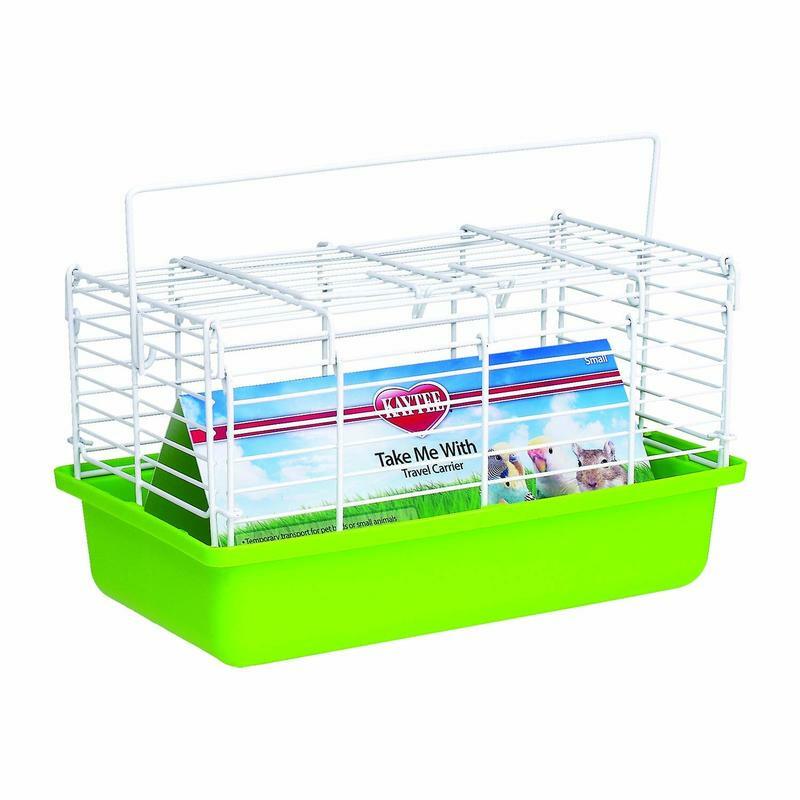 Local feed stores also seem to carry local farmer brand metal carriers too, so you may have luck purchasing one in-person and saving on shipping costs. One of the cheapest options, and likely local options ( Petco/Petsmart ), Between $10-$20. This is a solid metal carrier, which we own. 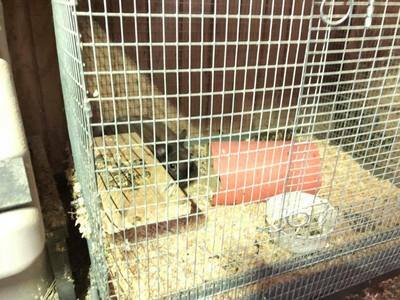 It is around $60.00: Sold by Quality Cage Crafters. Bass Equipment . 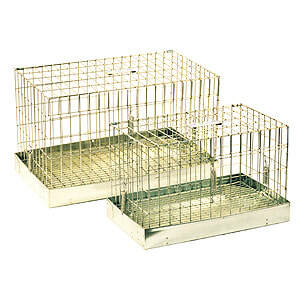 com also sells metal carrier cages. Prices vary by size, $20-$40. Wire-bottom is preferable during a long-term emergency situation to keep your pet off of soiled bedding.